Paris Kea drives past Jordan Nixon. Photo courtesy of North Carolina Athletics. 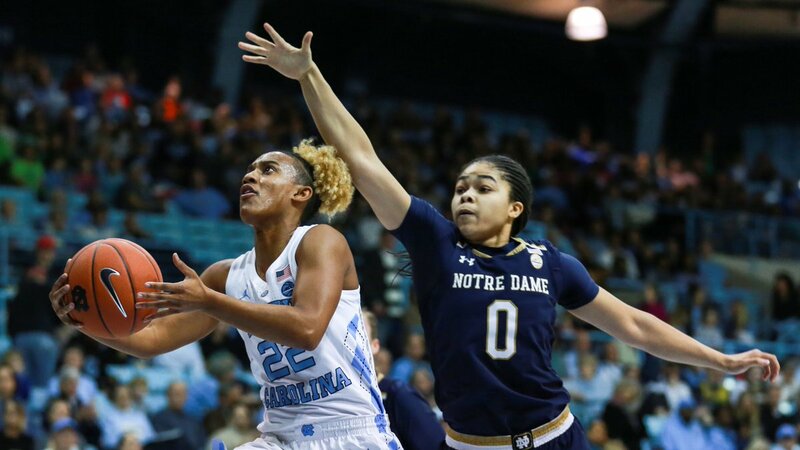 Chapel Hill, N.C. – Paris Kea scored a season-high 30 points and dished 10 assists to pace North Carolina past No. 1 Notre Dame, 78-73, on Sunday. 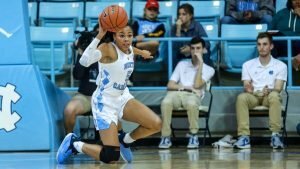 Stephanie Watts added 19 points for the Tar Heels and Janelle Bailey, 16, in collecting the program’s first win over a No. 1 opponent in almost 13 years. The loss was only the second on the season for the Irish. North Carolina coach Sylvia Hatchell said her team had prepared for big game situations, and were ready for their visitors. 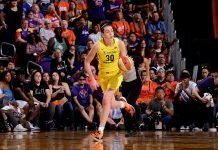 The game was a tense, back-and-forth match up until the fourth quarter, when the Tar Heels ran up a 10-point lead, which Notre Dame answered with a 12-point run. At the 1:25 mark, North Carolina reserve Leah Church hit her only bucket of the game with a corner three-point shot to give her team a 74-71 advantage. The Irish missed several key shots down the stretch, while the hosts grabbed rebounds. Marina Mabrey led Notre Dame with 20 points, while Jessica Shepard and Brianna Turner each scored 19. The team was without starter Jackie Young, who turned an ankle in practice over the weekend. Kea said the Tar Heels’ screaming fans gave the team a boost. Irish coach Muffet McGraw said the loss wasn’t due to Young’s absence. Stephanie Watts passes from one knee. Photo courtesy of North Carolina Athletics. Watts said the team is bolstered by the statement win. Hatchell said North Carolina hasn’t yet reached their full potential. “That ‘wow’ is preceded by fear, but followed by joy … There’s another level, maybe two more levels that this team can reach,” she said. The 12-9 Tar Heels host Georgia Tech Thursday, while Notre Dame travels to play Clemson the same day.